From the hit movie Gremlins 2: The New Batch! Cast directly from an original film-used stunt puppet! 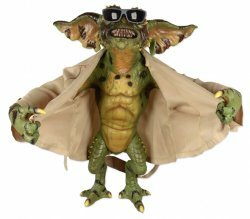 This prop replica of the Flasher Gremlin is an absolute must-have for any Gremlins collector! This hand-painted rubber and latex figure stands nearly 30 inches tall and features a fabric trench coat and removable sunglasses, all entirely faithful to Flasher's on-screen wardrobe. Comes complete with a metal display stand. The perfect addition to your Gremlins collection! Important Purchasing Instructions: U.S. shipping only. This is an over-sized item in a large shipping carton. You must choose your desired shipping service at the drop-down menu above and in the shopping cart when completing your order. Standard shipping is via USPS Ground. Priority Mail 2-3 day delivery is available, however a DIM Weight surcharge required by USPS is added to the price of this item.